In SEO, your goal should be to understand the keyword landscape of a topic. What keywords do people search for, and what does this tell us about their intent? What can we learn from looking at keywords in a broader context? For PPC, your goal should be to find the keywords that you can bid on. Which keywords are going to make you the most potential money for your cost-per-click investment? You should focus on keywords that suggest a purchase (or goal completion), that represent a category area that is profitable for you, and that you can’t easily get ranked for in organic (most of the time – there are exceptions to this). Let’s start with PPC this time. And no, I don’t know the airspeed of a swallow, laden or unladen, so I’d be thrown into the abyss. But I do know PPC. You’ll use the keywords in your campaigns and ad groups, in your ad copy, and on your landing page. You want to have a very tight correlation between each so that your Quality Score is high. 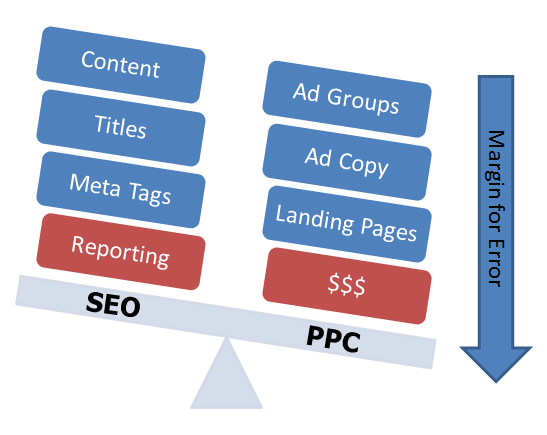 This is pretty much it in terms of how you will use your PPC keywords. For SEO, you’ll use these keywords as the foundation of everything that you do. Ideally, you’ll correlate your existing content on your website with them, find the gaps, and decide if you want to create additional content to fill those gaps. You’ll identify a focus keyword or two for each page on the website, and correlate the meta tags, title, and content to match the focus keyword. You’ll also use those keywords to track and benchmark your ranking progress. I’ve created a handy image below that explains this. In SEO, your margin for error is very large. If you use a keyword in a way that just doesn’t work, you’ll adjust it and try again. You may find yourself ranking for or getting traffic for keywords you didn’t think about. Those are a bonus, and you can just add them into your reports as needed. You’ll also want to refresh your keyword research every now and then to make sure there aren’t new advances, technologies, products or ideas that weren’t popular when you first did your research. Since SEO doesn’t cost a fee per keyword, you won’t (or you shouldn’t) shy away from high competition words that you may not get. It doesn’t hurt you at all to continue competing for those, and if anything, it makes it easier to qualify for many longer tail keywords. Plus, on the user experience side, it makes your site much cleaner, because instead of having headings like “Wedding Accessories for Dog Ring Bearers”, you can stick with “Wedding Accessories” or the more specific but still high volume “Ring Bearer Pillows”. It’s important to adjust the depth of the keyword to the depth of the site, with top level pages using broader keywords and sub-categories being much more specific. Conversely, the margin for error in PPC is small. Every mistake costs you money. Every keyword that you bid on puts you in direct monetary competition with other sites. You need to go over your keywords with a fine tooth comb, cutting out any that aren’t working, adding negatives, expanding to new opportunities, and always with one eye on the cost per click and the other on the Quality Score. You need to make sure your keywords are tightly categorized by theme, that your ad copy is performing as well as it possibly can, and that your tight ad group/keyword strategy extends to your landing page and the way keywords are used on it. The efforts must be meticulous and calculated. So the next time you are tempted to ask your consultant why they didn’t include competition metrics in an SEO keyword list, or why PPC categories are done by keyword rather than intent, think about the differences between the two mediums. And remember that just because data is available, it doesn’t mean it is necessarily useful in all contexts. Thanks to Monty Python and the Holy Grail’s Bridge of Death scene for being the inspiration for my headings. Jenny Halasz is the President of an online marketing consulting company offering SEO, PPC, and Web Design services. She's been in search since 2000 and focuses on long term strategies, intuitive user experience and successful customer acquisition. She occasionally offers her personal insights on her blog, JLH Marketing.